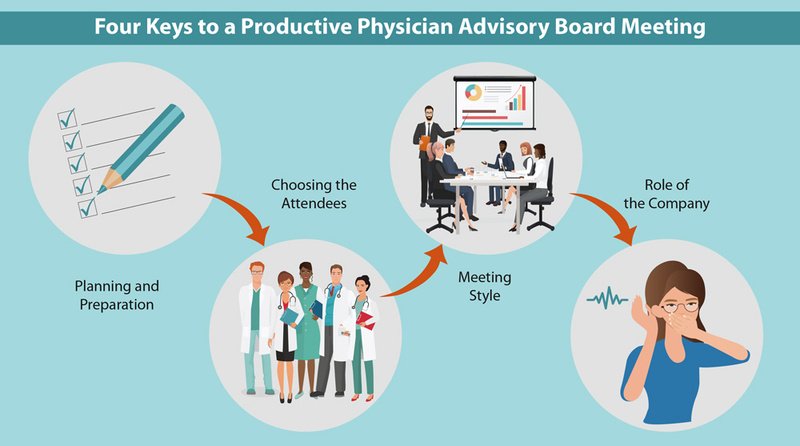 Physician advisory board meetings are quite common in our industry — and, done well, they can be very helpful. Convening a face-to-face meeting with a group of expert physicians in a given therapeutic area benefits biopharma companies in several ways. Some of these include: verifying assumptions about unmet medical needs in the market; gaining insight regarding future rollout strategies; optimizing trial designs; and promoting education and awareness, particularly regarding unknown or rare diseases. Clearly, the benefits are significant. But so are the risks. First, identifying, vetting, contacting, and coordinating potential board meeting members takes time, effort, and money. Second, as the host of a physician advisory board meeting, your credibility and reputation will be under scrutiny. And trust me, these physicians love to share their “good, bad, and ugly” pharma/biotech stories! Third, and maybe most important, these events offer a tremendous opportunity for learning and direction — but it is an opportunity that is only realized if the meeting is well thought out, well organized, and well run and if the company focuses on fully listening vs. telling. In other words, if you are going to invest the time and resources to hold one of these gatherings, you better make sure it brings value to the company and to the participants who have invested their time and intellect. In our experience at The NemetzGroup, the most successful meetings begin long before the event itself, with significant up-front planning. For starters, it’s important to establish clear meeting objectives with alignment from the executive team. This way, you are both maximizing productivity and gaining a sense of how big a bite of the apple to take in scoping agenda topics. These objectives should be clear and focused. For example, you may want the physician experts to weigh in on the Phase 3 design that you intend to share with the FDA and guide you regarding anything you may be missing. Or, perhaps you need their insights regarding a rare disease that is your area of focus and want to hear how best to educate the broader community. It’s also important during the planning phase that you take a cross-functional view. Particularly if you are premarket, it is a missed opportunity to focus solely on one silo of the business without considering corporate and cross-functional goals as well. Not to call any function out (but here goes), we often see the “clinical” team run these meetings and, in doing so, rarely checking in with their colleagues in medical affairs or commercial to see if there may be any questions/concerns/issues that this expert panel could address. Take advantage of this opportunity for broad-based insights and future relationships within the company. Ideally, you are looking for a group of 9–12 physician experts. Small enough for discussion, large enough for a range of perspectives and the ability to subdivide into working groups as necessary. Increasingly, companies are interested in multi-disciplinary or multi-level groups to model how decisions are made in a clinical setting. Regarding group makeup, while it’s fine and expected that there will be “friends” of the company in attendance, keep in mind that friends tend to share your optimism and enthusiasm (that’s why we love them). Also, you probably already know what they think. So, you also want dissenters — experts who will challenge your assumptions and, if warranted, check your excitement. After all, this is exactly what the naysayers at large will do once you bring your therapy to market; better to hear it now, adjust, and prepare as needed. As for personality types and areas of expertise, the key word is “balance.” People who push back but are not disruptive. People who have lots of experience (“experts”) as well as people who have a fresh outlook (“up and comers”). People who represent a range of specialties so that the discussion isn’t overly focused in one area. Academics as well as those with a community-based orientation. Finally, and long before they arrive at the meeting, consider whether or not you want participants to sign a contract as part of their involvement. If so, be thoughtful about the contract scope and be as broad as is reasonably possible. You may want to use the meeting audio, video, or specific quotes in white papers or other forms of communication, so don’t limit the opportunity to use this valuable content before the meeting even begins! Given that the overall goal of these meetings is to maximize physician brain power by tapping into the minds and experiences of those present, we strongly favor a highly interactive approach as opposed to a didactic one in which attendees sit through presentations. For us, that means employing a number of interactive tools and constructs throughout the meeting. Examples include Poll Everywhere, a free tool for creating live, interactive group participation; breakout teams; mini-workshops; even role-playing, in which we ask physicians to depart from their typical role as clinicians and wear other hats as “payer,” “patient,” or “biotech company C-Suite executive,” thereby forcing them into raising points from an entirely different perspective. Note, by the way, that my use of the word “forcing” in the previous sentence was intentional! Yes, these are physician experts. But they are well paid, willing participants too. It’s up to you to define a structured agenda and direct them into subgroups, ask them to complete exercises, require that they reach joint compromises, etc. Whatever you feel will satisfy the objectives of the day. Don’t be afraid to guide them! They want to provide value; make them work for their honoraria. At the risk of appearing self-serving (but many know me so well), I strongly suggest that you hire an outside firm/moderator to run these meetings. Not just because there is a skill to moderating and leveraging expert input (although that’s part of it), but also because those inside your company tend to have an agenda and a point of view. They have skin in the game, and they want things to lean a particular way. All of this gets in the way of you gathering the kind of objective, real-world insights you are seeking. As for how many internal folks to include in these meetings, our rule of thumb is that you have no more than half as many of you as there are physician experts present. Even though you may record these sessions (recommended), the more internal people physically present, the more your experts will feel like they are being scrutinized and evaluated, both of which will dampen candidness. It’s vital to remind company attendees that they are there to listen, not talk. Yes, you will answer questions and make personal connections with attendees, but you need to resist the urge to interject opinions and bias insights. Lastly, it’s important to assign someone in your organization the explicit role of staying in touch with the physician experts over time. You may want to invite some of them back at a later date and the more you’ve kept them in the loop over the intervening months, the more willing they will be to stay involved in the process. And, as your mother always said, be sure and send a “thank you” after the meeting. People have a choice where they spend their time; you owe them gratitude for spending it with you! Physician advisory board meetings can be enormously useful. Unfortunately, they can be an enormous waste of time and money as well. Apply these four keys to your next meeting and you will get the biggest possible bang for your physician advisory board meeting buck!